Shaft Preparation for Shaft Grounding Rings | Electro Static Technology, Inc.
AEGIS® Bearing Protection - Why Shaft Grounding? Fill the keyway (in the area where the AEGIS® microfibers will be in contact with the shaft) with a fast-curing epoxy putty such as Devcon® Plastic Steel® 5 Minute® Putty (SF). Shaft must be clean and free of any coatings, paint, or other nonconductive material (clean to bare metal). Depending on the condition of the shaft, it may require using emery cloth or Scotch-Brite®. If the shaft is visibly clean, a non-petroleum based solvent may be used to remove any residue. If possible, check the conductivity of the shaft using an ohm meter. Place the positive and negative meter leads on the shaft at a place where the microfibers will contact the shaft. Each motor will have a different reading but, in general, you should have a maximum reading of less than 2 ohms. If the reading is higher, clean the shaft again and retest. Thoroughly stir the silver coating. Apply a light coat of the AEGIS® Colloidal Silver Shaft Coating to the area where the AEGIS® microfibers are in contact with the motor shaft. Apply evenly all around the shaft. Allow to dry. Coating will cure at room temperature in 16-20 hours or in 30 minutes at 120-200°C. A heat gun will cure the materials in seconds. Apply a second coat for best coverage. Allow to dry. 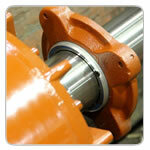 After coating is dry, install the AEGIS® Shaft Grounding Ring. Follow all safety precautions. GHS SDS for CS015 available for download here. After installation, test for a conductive path to ground using an Ohm meter. Place one probe on metal frame of AEGIS® SGR and one probe on the motor frame. Motor must be grounded to common earth ground with drive according to applicable standards. Where AEGIS® SGR is exposed to excessive debris, additional protection of the AEGIS® fibers may be necessary. Contact AEGIS® Customer Service/Engineering for assistance with specific applications. Install an o-ring or v-slinger against the ring. For complete details on Shaft Preparation and Installation click here to download the AEGIS® Handbook.